Two months ago, during deep clean, I took my largest compressus,Houdini, out of the tank, turned him over to have a look, and a red…thing fell out of his shell. I couldn’t believe it! Mites!Huge, red mites. Houdini had a few, Fifi had some, and poor Ghidra,a pre-molt rugosus, was covered with them. I was appalled. I inspect new crabs when I get them for mites, and have never seen any. The only explanation I have is that these mites, being a bright red color, must have snuck in on some of the perlatus – they are the same color red. I have seen these mites on my gray crabs, the brown ones and the beige ones, and still haven’t seen them on the perlatus. My eyes are just not good enough to find them on the red crabs. Another thing that made me think these mites came from the perlatus was that they were completely unfazed by a prolonged salt water bath. Mites are supposed to float off the crabs, and if they were another type of mite, perhaps they would have. But they held on to the setae for five minutes under the water and never a one floated up. It seems to me that if they were perlatus mites, they would be used to being dragged into the ocean for long periods of time, as the perlatus love to go swimming. It didn’t really matter where the mites came from, however; just the fact that they were present was a problem enough. My tank is 120gallons, some of the wood doesn’t fit in the oven (or can be baked safely). The mites wouldn’t come off with a regular salt bath. I’ve read post after post of people who seem to have perennial mite problems; no matter how hard and well they deep-clean, the mites come back again and again. Then I found two of the smallest crabs, dead in the substrate. I don’t know for sure, but I suspect the mites may have either drained them dry or stressed them so badly during premolt that they couldn’t survive. Either way, I had a real problem on my hands. I looked around on the Web for days, trying to find a solution. I found some things that looked interesting and perhaps useful, like Zoo-Med’s Mite-Off, but couldn’t get a good answer about whether or not the products would harm the crabs. I know all about insecticides, organic and chemical, but I don’t know anything about electrically-charged colloids. I don’t know what they would do to the crabs, but I couldn’t take a chance. Not this time, anyway. I figured I’d save the Mite-Off as a drastic last resort. Then I came across something really interesting, that had occurred to me before, but I didn’t want to try first: predatory mites. I read on several sites that people use a common soil-dwelling mite predator to combat snake mites and other mites on reptiles and arachnids. The species of mite is even one I had used in my auntie’s greenhouse to kill root aphids and thrips: Hypoaspis miles (which shall be called Hypos for short from now on). Finding evidence that other exotic animal owners had used Hypos successfully, I logged on to my beneficial insect supplier and ordered one bottle of 12,500. 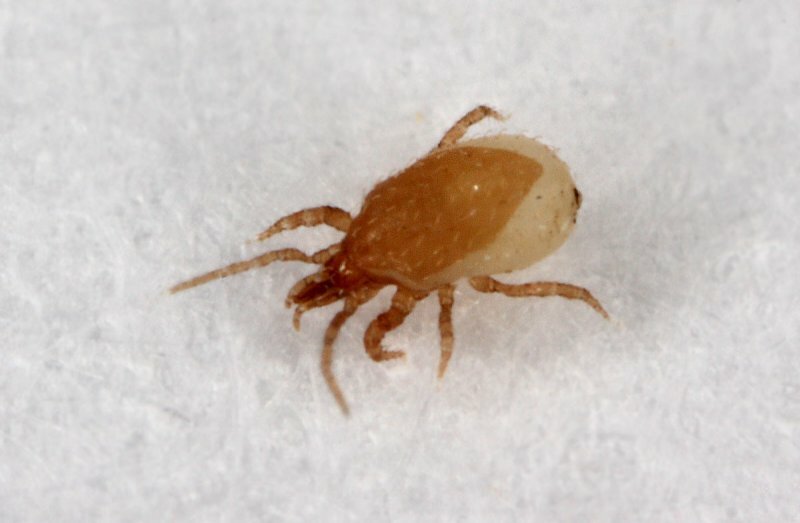 Hypoaspis miles is a soil-dwelling, predatory mite that is native to the United States. Hypoaspis feeds on fungus gnats, springtails,thrips pupae, and other small insects in the soil. The mite is 0.5mm (1/50 inch) long and light-brown in color. It inhabits the top1/2 inch layer of soil. Females lay eggs in the soil which hatch into nymphs in 1 to 2 days. Nymphs develop into adults in 5 to 6days. The life cycle takes approximately 7 to 11 days.Both nymphs and adults feed on soil-inhabiting arthropods, consuming up to 5 prey per day. They survive by feeding on algae and/or plant debris when insects aren’t available. Both males and females are present, but males are smaller and rarely seen.Hypoaspis is well adapted to moist conditions in greenhouses in a variety of growing media, but does not tolerate standing water.Hypoaspis is currently used in greenhouses for control of fungus gnats. It feeds on the young fungus gnat eggs and small larvae and is most effective when applied before fungus gnat populations become established or when populations are low. It has been successfully used in bedding plant production, potted plants, and poinsettia stock plants. The mite is formulated in a pasteurized peat mixture for commercial use. They are usually sold in 1 liter containers,which contain approximately 10,000 mites of all life stages.Containers include a shaker lid which allows for distribution over the soil surface, after which Hypoaspis will burrow into the soil.One application can establish a mite population for an entire growing season under optimal conditions. A recommended application rate from IPM Laboratories, Inc. is 1 liter container per 1000 ft2.In vegetable production, recommended applications rates for cucumbers are 4 to 8 liters per 50,000 ft2 and 10 to 12 liters per50,000 ft2 for tomatoes, with applications being made when young plants are set out in the greenhouse. Hypoaspsis will also attack thrips pupae in the soil, but cannot be relied on for thrips control alone in a commercial greenhouse. It may, however, enchance biological control when used in conjunction with predators feeding on thrips on the foliage. In small-scale experiments this mite reduced emergence of adult thrips to about 30%of that in controls.As with all purchased natural enemies, it is important to ascertain the quality and/or presence of mites in the container. You can do this by placing a small sample on a sheet of white paper, and examining it with a 10-15X hand lens to look for the quick-moving mites. Hypoaspis moves well on soil surfaces, so it is unnecessary to apply to all surfaces. Although they will move between plants inpots, at least every second plant should be treated. Application needs to be made early enough to allow the mite to spread. They won’t move throughout an entire greenhouse from a single introduction point. Hypoaspis doesn’t survive below the top 1/2 inchof soil, so mixing mites into the growing media prior to potting isnot recommended. In addition, Hypoaspis doesn’t store very well;therefore it should be released immediately upon arrival. The mite is compatible with insect-parasitic nematodes, such as Steinernemacarpocapsae and S. feltiae, and Gnatrol, the biorational insecticide containing Bacillus thuringiensis var. israelensis. When I used Hypos in my auntie’s greenhouse, I was astonished to see them still there two years later. This is because my auntie used hydroponics, and the medium was washed and sterilized after each growing season. And yet these hardy little insects were still managing to recolonize the individual gallon pots she kept her vegetables in. It was amazing, and I was very impressed by how persistent these little helper bugs were. I received my mites about a week and a half later. The shipping was more expensive than the mites themselves, as the insects need to be shipped overnight. But, 12,500 mites is less than $30. With shipping, I was out $68. I think that’s a bargain for the results I got. At first, I was very conservative with the treatment plan. The mite container can keep the mites alive for about two weeks, so you can spread out your treatment. I put a clamshell of carrier, which was wood chips (small chips, not shavings) in one ISO, two in Ghidra’sISO, and three large ones in the main tank in strategic locations.Wouldn’t you know, one of the rugosus decided to snack on the mite carrier. No big deal, it wouldn’t be insecticidal, as it’s a carrier for insects. At least Camo got some cellulose that way, and a good dose of Hypos. Later that same day, Itchy galloped through one of the bigger dishes, and I saw her scoot off to spread the love. I rubbed my hands together with glee. By the end of the two week period, I decided it’s better, when treating a mite infestation, to do two large treatment doses over the two week period, and put as many Hypos into a tank as feasible in one shot. It seemed to work better with more Hypos added to the tank at one time. I used Ghidra as my main subject, as I knew exactly where she was in a small tank, and she was the worst affected by the mites. She literally had dozens of them on her, poor thing, and was just miserable. Daily, I would check her while the treatment was going on. During that time, I got impatient with the Hypos’ slowness (this being the main drawback of using natural pest control in this manner) and started using a hand mister of salt water to lightly spray the mites off the crab. Held over a bowl of salt water, they would fall off, and be unable to escape, and I could drown them allin the sink when it was over. A great many adult mites died in this fashion; this is a good thing, as the Hypos won’t eat the adults,except in extremes. Daily, fewer adult mites showed up on Ghidra. Ihave checked her a total of three times in the past two weeks, as she is in premolt and I don’t want to bother her unduly, and she hasbeen mite-free all that time. After six full weeks of using Hypos in her tank, I think I can confidently say that Hypoaspis miles are without a doubt, the most efficient, cost-effective, non-labor-intensive mite treatment of them all. Put “Hypoaspis mites” in the quick search box, and the Hypos will come up, Item Number CHM125C. Note: This website is gone. Check this list ofdistributors of beneficial insects. Wait patiently for your order, but prepare in the meantime. 2) Daily until the order arrives, hand mist each crab over a bowl of salt water to remove any visible adult mites. 3) When the mites arrive, set up a humid place to keep the container – even in the crabitat, with the lid on, would work. I put mine on top of a bookshelf, inside a plastic garbage bag with a wet sea sponge, with the mouth of the bag hanging down over the shelf, so that air could circulate, but the humidity would stay inside. 4) Lightly dampen your substrate, should it be dry. The mites do better in damp conditions. 5) Place shells or bowls full of carrier around the tank or tanks,about half the total bottle. I would recommend sprinkling it around,but that could set up a mold problem, and would make cleaning the substrate harder in the end. If you use incandescent or heat lighting, do this during the cooler night cycle, so the mites have time to disperse.Leave the shell or dish of carrier in until then ext treatment, in about a week. 6) Continue to mist the crabs during the treatment that have visible mites, to remove them. This is much better than stressing out a crab with an unwanted, long, ineffective bath. 7) In one week, remove the old carrier dishes and replace with new ones, using up the remaining mites in the jar. 9) In one week, remove the remaining carrier. 10) Wait patiently. In about a month or so, all crabs above the substrate should be mite-free. Mites are not long-lived species, so the ones that have escaped being removed manually will die of natural causes. The Hypos are there for the eggs and larvae. My substrate is sand, which worked well, but for people with organic substrate like coconut fiber, I think this will work better, faster,and for longer, by the very nature of the Hypos themselves. All in all, I am very pleased with this treatment, and I recommend it very highly. Though you can shop around for Hypos from other vendors, the Green Spot is one of the least expensive, and they always send live insects. Some of the other dealers don’t always ship live ones. Got mites? Get some more, but get the right mites for the job: Hypoaspis miles. The Green Spot, Ltd.93 Priest Rd.